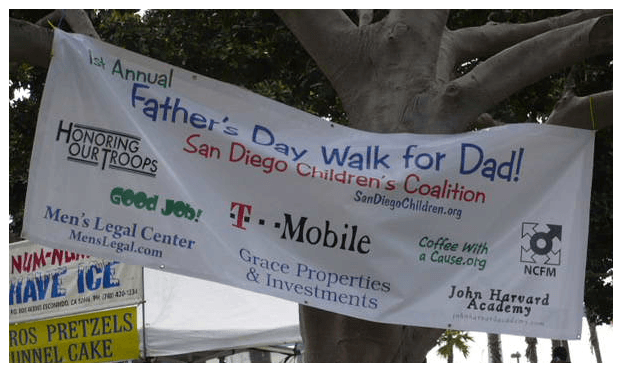 First ever Fathers Day Walk-a-thon in San Diego. Plan one for your community next year. 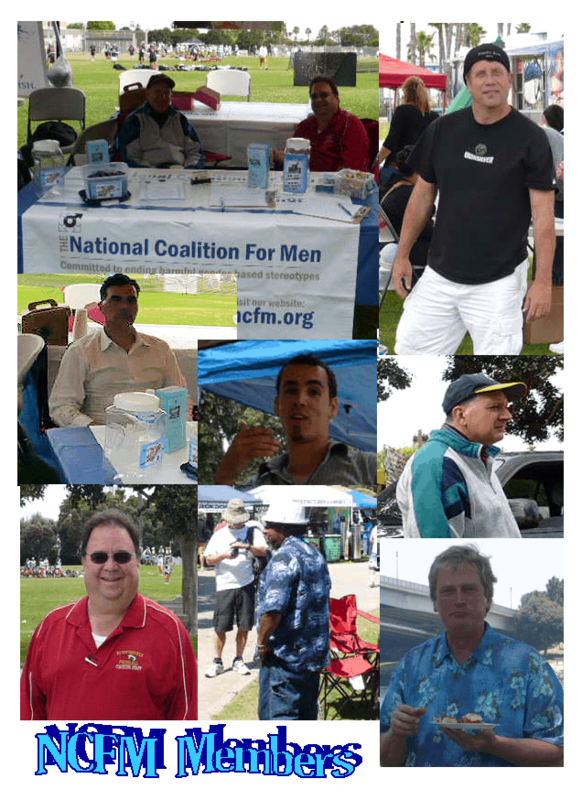 The National Coalition For Men paticipated in the first ever Fathers’ Day Walk-a-thon in San Diego. The event show cased the San Diego Children Coalition. NCFM had an informational booth and as a sponsor out logo was included in promotional materials, NCFM wristbands, t-shirts, and a large banner at the start/finish line. NCFM is a founder of the San Diego Children Coalition and we are honored to be involved in this first ever celebration of Fathers. There was a festival in conjunction with the walk-a-thon with hawkers and vendors, one with great hotdogs and hot sausages! Some of the vendors were upset. The San Diego Port Authority had double booked the park without telling the promoters. Consequently, a large lacrosse tournament took up most of the park, vendors had to be relocated, and parking lots were filled primarily with lacrosse players and fans. Hence, there was no turnover. 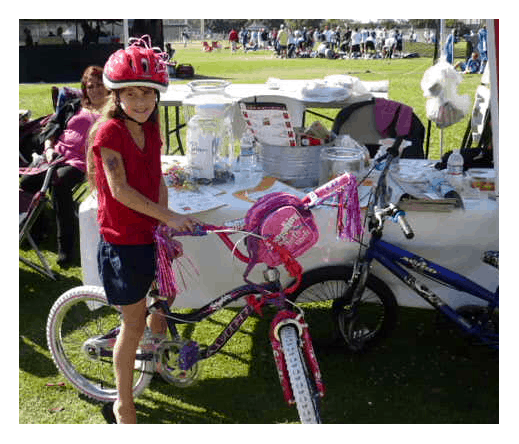 Since the park is located on Coronado Island (rich community) the vendors were hoping the Coronadoians would be able to attend the festival. Some were, but most of those walking through the rows of vendors were the same people all day long, people who were with the lacrosse tournament. The double booking also impacted our walk-a-thon. Regardless about 30 people showed up for the walk. They were excited to be part of a father’s day event and had a great time. Each of them also got a walk-a-ton t-shirt. All and all it was a great event. 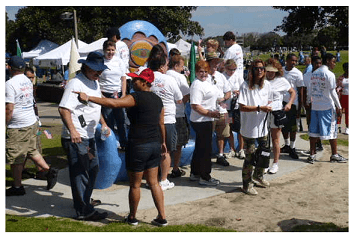 NCFM San Diego has numerous community based associations. Four of us lined our booths up next to each other. First came NCFM, then the San Diego Children Coalition, Honoring Our Troops, and the Mens Legal Center. 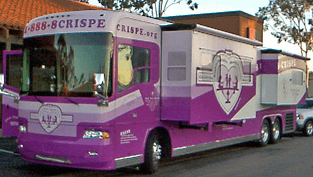 Some of you may remember our involvement with CRISPE (Children Rights Initiative for Sharing Parents Equally) with the “Big Purple Bus”. Larry Kirkman is “CRISPE-ONE”, his son, Trevor, is CRISPE-TWO, and as far as I know I’m still CRISPE-TWO. Well, we handed out, give away, 50 or so CRISPE t-shirts promoting shared parenting! Top to bottom, left to right: Joe Mantione, Kevin Young, Jeff Perwin (President San Diego Children Coalition), Greg Smart, Allan Candelore (Board Member Honoring Our Troops), Joe Mantione (better picture), Kevin Young (better picture), Walter Davis (set up equipment for live radio interviews so children could wish their fathers a happy Father's Day), and Mr. John Van Doorn. Several NCFM members showed up to help set-up, staff, and tear-down our educational booth where we had fliers and other information. stopped her tears, put her arm around the young girl who won the bike, and said, ‘I really happy you won the bike and I hope you really like it.” So, a bunch of us adults started crying. ‘Bought broke my heart. Then we found our her mother had just passed away. She’ll get her bike. An event is being planned at our local roller rink. Her father will be honored. She will get her bike. 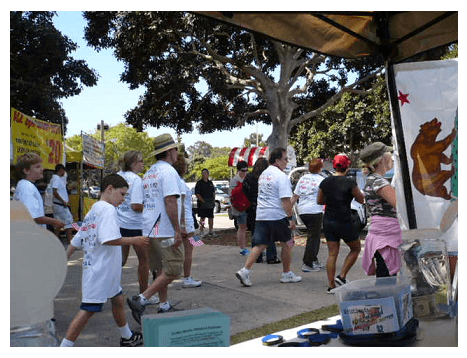 And, thanks to everyone who made this a great first San Diego Fathers Day Walk-a-thon! San Diego Dads deserved the celebration for all the good things they do. All and all it was a great day, except I got sunburned. My nose is still peeling. Great to see the table thank you everyone!